Home » Getting Active » Fitness and Health: Why track goals? Fitness and Health: Why track goals? If you’re struggling to get motivated or your weight loss goal seems too far-fetched, write it down. This simple action can jump start all the steps that will take you from where you are now to where you want to be. Whether your goal is running a 5k or losing 60 pounds, the process starts with making that goal concrete. Setting ongoing, reasonable fitness goals is a key factor as you work to maintain weight loss. As you lose weight and maintain weight loss, use tools to track your progress. These tools keep the process real and keep you present as you work toward the goal. Think back to your childhood. Did your teachers use charts to track progress in school? Those same techniques can be effective in adulthood. Use a journal, calendar or chart to track every step of your journey. 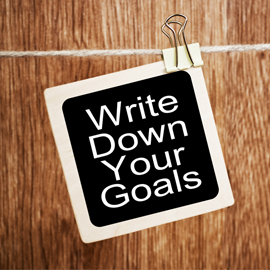 Make daily goals, weekly goals, or goals based on milestones. Share your steps and improvements with a friend or use online resources like a blog or Facebook to build a support system. Reward yourself appropriately. Before you know it, your goal will be in reach.